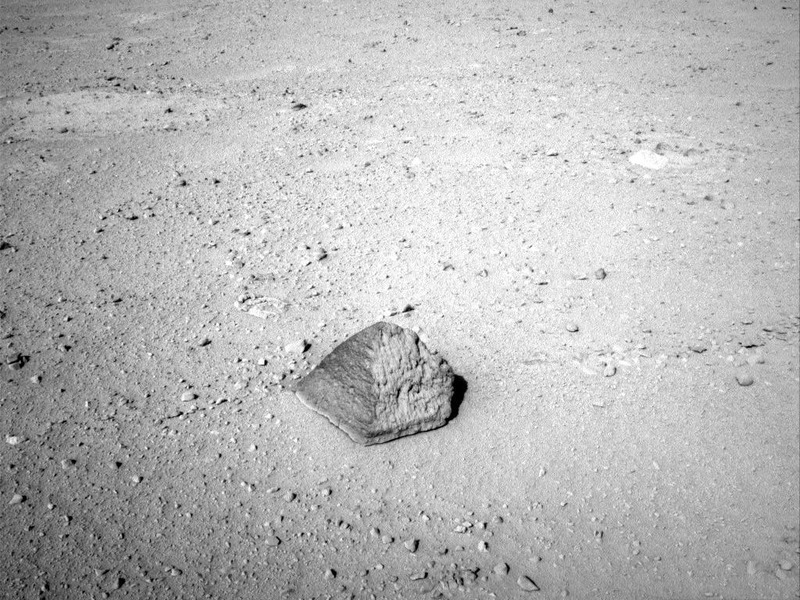 Curiosity is about 8 feet (2.5 meters) from an unusual rock. It lies about halfway from the rover's landing site, Bradbury Landing, to a location called Glenelg. In coming days, the team plans to touch the rock with a spectrometer to determine its elemental composition and use an arm-mounted camera to take close-up photographs. "As we're getting closer to the light-toned area, we see thin, dark bands of unknown origin," said Mars Science Laboratory Project Scientist John Grotzinger of the California Institute of Technology, Pasadena. "The smaller-scale diversity is becoming more evident as we get closer, providing more potential targets for investigation." Both the arm-mounted Alpha Particle X-Ray Spectrometer and the mast-mounted, laser-zapping Chemistry and Camera Instrument will be used for identifying elements in the rock. This will allow cross-checking of the two instruments. Curiosity now has driven six days in a row. Daily distances range from 72 feet to 121 feet (22 meters to 37 meters). The rock has been named "Jake Matijevic." Jacob Matijevic (mah-TEE-uh-vik) was the surface operations systems chief engineer for Mars Science Laboratory and the project's Curiosity rover. He passed away Aug. 20, at age 64. Matijevic also was a leading engineer for all of the previous NASA Mars rovers: Sojourner, Spirit and Opportunity. "This robot was built to rove, and the team is really getting a good rhythm of driving day after day when that's the priority," said Mars Science Laboratory Project Manager Richard Cook of NASA's Jet Propulsion Laboratory in Pasadena, Calif. The team plans to choose a rock in the Glenelg area for the rover's first use of its capability to analyze powder drilled from interiors of rocks. Three types of terrain intersect in the Glenelg area — one lighter-toned and another more cratered than the terrain Curiosity currently is crossing. The light-toned area is of special interest because it retains daytime heat long into the night, suggesting an unusual composition. Researchers are using Curiosity's Mast Camera (Mastcam) to find potential targets on the ground. Recent new images from the rover's camera reveal dark streaks on rocks in the Glenelg area that have increased researchers' interest in the area. In addition to taking ground images, the camera also has been busy looking upward. 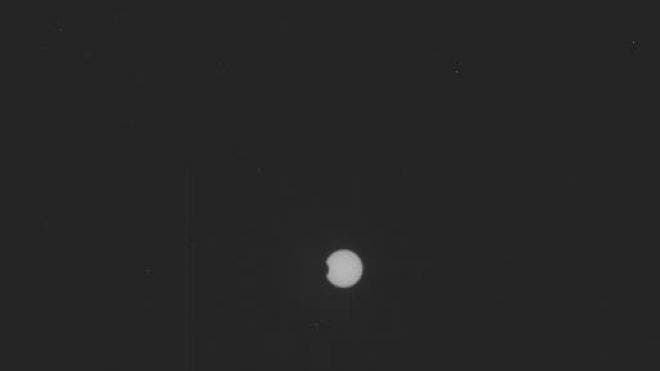 On two recent days, Curiosity pointed the Mastcam at the sun and recorded images of Mars' two moons, Phobos and Deimos, passing in front of the sun from the rover's point of view. Results of these transit observations are part of a long-term study of changes in the moons' orbits. NASA's twin Mars Exploration Rovers, Spirit and Opportunity, which arrived at Mars in 2004, also have observed solar transits by Mars' moons. Opportunity is doing so again this week. "Phobos (image below) is in an orbit very slowly getting closer to Mars, and Deimos is in an orbit very slowly getting farther from Mars," said Curiosity's science team co-investigator Mark Lemmon of Texas A&M University, College Station. "These observations help us reduce uncertainty in calculations of the changes." In Curiosity's observations of Phobos this week, the time when the edge of the moon began overlapping the disc of the sun was predictable to within a few seconds. Uncertainty in timing is because Mars' interior structure isn't fully understood. Phobos causes small changes to the shape of Mars in the same way Earth's moon raises tides. The changes to Mars' shape depend on the Martian interior which, in turn, cause Phobos' orbit to decay. Timing the orbital change more precisely provides information about Mars' interior structure. During Curiosity's two-year prime mission, researchers will use the rover's 10 science instruments to assess whether the selected field site inside Gale Crater ever has offered environmental conditions favorable for microbial life. For more about Curiosity, visit: http://www.nasa.gov/msl and http://mars.jpl.nasa.gov/msl.